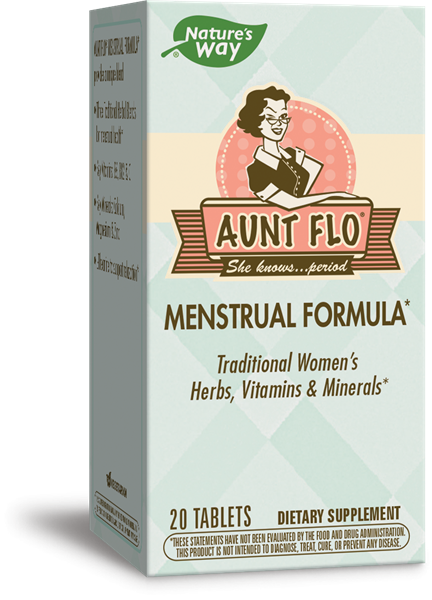 Aunt Flo® Menstrual Formula* - Nature's Way®. Take 2 tablets daily as needed, or as recommended by a healthcare professional. May take as 1 tablet twice daily. ‡Complexed with citrate, fumarate, malate, succinate, and alpha ketoglutarate. What is the source of L-theanine in Aunt Flo® Menstrual Formula*? L-Theanine is an amino acid present in small quantities in black, oolong, and green teas. Research shows that L-theanine can help reduce stress and promotes relaxation. * L-theanine is also free of the side effects commonly associated with other relaxing agents. * The L-theanine used in Enzymatic Therapy's product is Suntheanine®, a patented form of L-theanine, that is a trademark of Taiyo International, Inc. Suntheanine is produced using an enzymatic method. Do not use if pregnant, nursing, have a blood clotting disorder, or are taking blood thinning medication. If you have diabetes or are taking any medications, consult a healthcare professional before use. Persons with allergies to plants of the Asteraceae (Compositae) family, including ragweed, should use this product with caution.